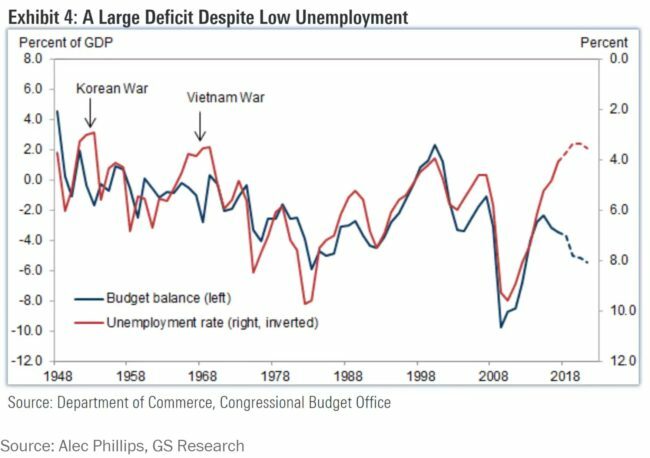 Back when the tax cut passed, this figure, also from GS, previewed an important fiscal fact about to unfold: outside of wartime, the Republican tax cuts and other deficit spending would add more fiscal juice to an economy already closing in on full employment than we’d ever tried before (note that the right-side scale is inverted; the point is low unemployment is usually associated much smaller deficits than we have now). This is all known, and no reason to bother your Sunday. That recent, big 4% pop in GDP was widely and correctly labeled a function of this stimulus and thereby unsustainable. Based on this revision, the figure below shows their updated prediction for GDP growth and unemployment. 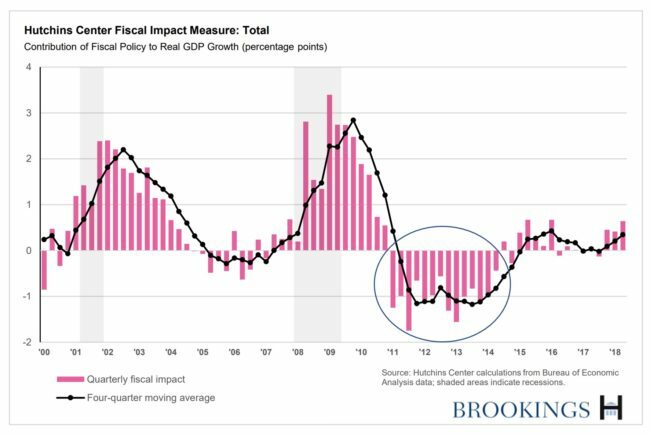 First, note that GDP comes off its unsustainable peak, underscoring the point that if GS is right, we’re looking at Keynesian stimulus, not Laffer suppy-side. But check out the jobless rate, which hits a low of almost 3% by the end of 2020. Now, 2020’s a long way off and while GS is better at this forecasting stuff than most, nobody’s very good at it. And, of course, conditions in the macro-economy are but one factor in play. If Trump was getting credit for the economy thus far, his approval rating would be a lot higher (though stagnant real wages are also in play, as I’ve stressed). Also, conditional on price/wage acceleration, the Fed might get spooked by the above scenario and move from brake-tapping to brake-slamming. 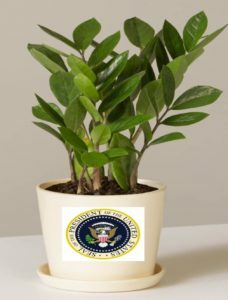 So…let’s hear it for PPP (Potted-Plant for President!!). 7 comments in reply to "Trump 2020 game plan: Fake Laffer, Go Keynes." Recent history has shown that when Democrats “consolidate our fiscal accounts” the next Republican administration takes advantage and cuts taxes on the rich. This happened with Clinton and Bush and with Obama and Trump. Democrats need to learn how to go for the jugular in all areas instead of trying to appeal to the business community and newspaper editors. You have rightly discussed how Clinton’s focus on deficit reduction and deregulation helped set the table for the bubble/bust shampoo economy. Just do government investment. Obama’s focus on deficit reduction (and malfeasance regarding the Fed) led to a recovery which was too slow and helped elect Trump. Nope, Trump wasn’t elected by the people and without Comey feeding anti-Clinton “ethics”, he probably only gets 45% at tops. Clinton, probably in the low 50’s. Where is the economics in that? You don’t get it nor that 3% unemployment is impossible. Look at the froth in corporate and consumer debt markets………..ugly. I mean, Jared, do you pay attention? We are seeing it in rising defaults. Corporate bond ratings have shot up because they want business to slow spending. Savings is practically nill and those boosts in savings is already gone. I have no clue, where you got your information from. My guess by December, you will give up finally on the Trump con. meh, that economy started in the 80’s when Reagan basically gutted Glass Steagall. Yes, it was dead in the 80’s, not the irrelevant 1999 “repeal of a corpse” when the debt bubble that burst in 2007 was already blowing up due to GS begin repealed essentially in the 80’s. If you want to be real honest, the late 70’s, but it was so small then, nobody noticed. As I said before, this cycle is done. Corporate yields are signaling thing have already slowed down and corporate borrowing must slowdown. Consumer savings are practically nill. Tax Cuts don’t work, especially with the decayed demographics of a aging populace. US growth is higher than it should be and will probably fall to a 0 for a year. There is nothing to stimulate that is financially possible with tax cuts. The reason it wont work is if the FED wants to control inflation the last thing they should do is hike interest rates. All else equal interest rate hikes are price hikes pure and simple because the increased cost of credit gets passed on to the consumer via higher prices. Then you have the interest income channels. If you raise the interest income channels, the higher the debt to gdp ratio the larger the effect. Paying interest is like basic income for people who already have £’s.They think they are stepping on the brakes when they are stepping on the accelerator. Interest on Treasury securities, $201.1 bln, up $15.9 bln and growing at 8.6% y-o-y. Interest payments remain one of the fastest growing spending items with an increase just behind Social Security and Defense Vendor payments. That’s a helicopter drop to the non government sector. The spot and forward price for a non perishable commodity imply all storage costs, including interest expense. Therefore, with a permanent zero-rate policy, and assuming no other storage costs, the spot price of a commodity and its price for delivery is the same. However, if rates were, say, 10%, the price of those commodities for delivery in the future would be 10% (annualised) higher. That is, a 10% rate implies a 10% continuous increase in prices, which is the textbook definition of inflation! It is the term structure of risk free rates itself that mirrors a term structure of prices which feeds into both the costs of production as well as the ability to pre-sell at higher prices, thereby establishing, by definition, inflation. Pick a graph any graph you like Jared after 7 us rate hikes the $ has got weaker and US inflation is at a 6 year high. Increasing interest rates don’t fight inflation they fuel it and they don’t make the $ stronger they make it weaker. So what will probably happen is the FED will continue to hike rates thinking they are fighting inflation but they will be causing it and Volcker the US economy. One of the most enduring clichés is the following: “Paul Volcker broke the back of inflation.” Whoever came up with this is a marketing genius because people are still walking around today, 36 years later, repeating this ridiculous lie. By 1974 Burns had jacked up the discount rate to 8% — a 60% increase — and inflation had gone from 5.6% to 10% annually. By November 1976 Burns had reduced the discount rate to 5.25% from 10% and inflation had fallen to 5% annually. Then by August 1979, which is when Volcker was appointed as Fed chairman, the discount rate was all the way back up to 10.5% and inflation had jumped to 11.8%. It is clear the inflation rate followed the interest rate. Volcker continued to raise rates, pushing the discount rate to 13% by February 1980. The economy entered a recession in March of that year, but inflation was still running at 14% When Volcker raised interest rates he caused the inflation he never broke inflation he broke the economy. Mainstream monetary policy is not a science it would fail at every level because the real hard data does not back up the theory. Show me one piece of real data after 7 hikes Since Dec 2015 that increasing interest rates fights inflation and makes the $ stronger. Maybe we see 3%, but I’m keeping my eye on Initial Unemployment Claims. As Trump’s tariffs increase in impact, a lot of industries will be hurting and I’m expecting claims to rise and hiring to slow. Add to that more tightening by the Fed and bingo! which I had great difficulty absorbing. It seemed oblivious of the fiscal austerity imposed by Republicans in Congress. That austerity’s impact seems to have been first felt in mid 2012, just when Republicans could get maximum benefit in the 2012 elections, but the FHSW paper totally ignores its impact. It doesn’t seem right for their paper to ignore such pressure on the demand side, even when they are only considering output (supply).